Garfield NJ is a city located in Bergen County. The city was known as East Passaic until the early 1880s when it was renamed after the 20th president of the United States, James Garfield. As its former name suggests Garfield NJ is close to Passaic, with bridges over the Passaic River connecting it to neighboring Passaic County. Served by both bus and rail lines, there is easy access into New York City from Garfield NJ. Two rivers intersect in Garfield, the Passaic River, and the Saddle River. In fact, Garfield is where the Saddle River ends, flowing into the Passaic River. Access to water makes Bergen County and the Garfield NJ area a popular spot for rowers and rowing clubs. Whether rowing for competition or pleasure there is great comfort in being able to keep bodies aligned and fit with the help of the experienced NJ physical therapists at Elite Spine and Sports Care. Today, getting in and out of Garfield is easy, served by great transportation that makes doing business in the city as well as outside of the city easy. It is the ease of access that makes Garfield NJ a hub of activity for residents and businesses alike. Recreation in Garfield NJ enables all ages to participate in some form of activity. Whether little league or softball, there is something for children and adults. Likewise, there are activities for the elderly citizens of Garfield, including trips to Broadway shows, bingo, and art offerings. Everyone has the opportunity to stay in shape mentally and physically. 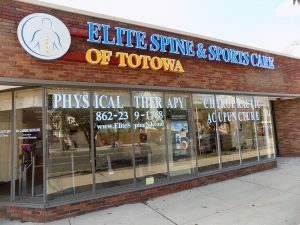 In addition, the services provided by Elite Spine and Sports Care of Totowa ensure that people can be fit and ready for action regardless of their activity level. Active residents of Garfield NJ benefit greatly from the services available from the nearby Elite Spine and Sports Care of Totowa. Access to chiropractic care, acupuncture therapy, massage therapy, therapeutic taping, pre-operative conditioning, and pre and post natal corrective exercises through Elite Spine and Sports Care makes it possible to both address issues and prepare a body to avoid injuries at the same time. The goal of our team is to help residents from Passaic County and Bergen County achieve their goals of living a healthy and active lifestyle.